Whenever we watch “The Simpsons,” we’re always happily amazed by the convoluted plots they’re able to squeeze into an episode. How they can start at scene one with, say, Lisa getting a pet goldfish and end up 23 minutes later deep in a story about an opera performance that will save the town of Springfield from space aliens who won the Earth in a game of poker. How do they do it? But isn’t that just like life? If you let yourself move from moment to moment, you just never know where you’ll end up. The path between two points is rarely a straight line. Like today, when I woke up with a song from “Hamilton” in my head (as I tend to do most days), and I thought it was inevitable that I’d be writing about one of those songs here. A few hours later I found a link I’d emailed myself a year ago, a song by Leon Bridges that I’d wanted to remember (and promptly forgot). I played it and it blew my mind all over again, how much this young man reminded me of Sam Cooke. I swayed and nodded through his debut album all afternoon. 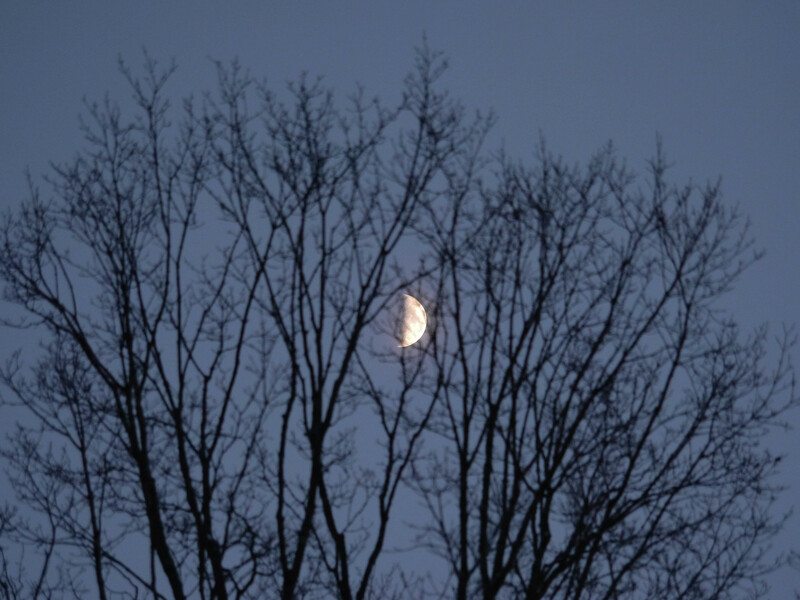 The fires cooled and dusk dropped over the hill and suddenly there was the moon climbing the maple tree. Lovely Leon was forgotten. Ella Fitzgerald can do that to anyone. I swear I had a point I wanted to make here, but I’m tired and moon dazzled and we’ve traveled far since this morning. The thread of my day is in knots, but it’s nothing that can’t be untangled by a lullaby and a gentle night’s sleep. What a great mix of music. Thanks for the stream of consciousness of the day! I’ve loved Ella for a long time, but I didn’t know about Leon. Thank you! Your post warmed me on this cold rainy morning. My pleasure! Would love to know what you’re listening to these days, if anything.